« Should Christians Observe Valentine’s Day? Although Protestants like to think positively about Martin Luther because of his supposed belief in sola Scriptura (the Bible alone), the truth is that Martin Luther changed parts of the Bible and discounted the value of many books. This passage strongly suggests that Martin Luther viewed his opinions, and not the actual Bible as the primary authority–a concept which this author will name prima Luther. By “papists” he is condemning Roman Catholics. It need not surprise one to find here bits of wood, hay, and straw (O’HarePF. The Facts About Luther, 1916–1987 reprint ed., p. 203). St. James’ epistle is really an epistle of straw…for it has nothing of the nature of the gospel about it” (Luther, M. Preface to the New Testament, 1546). “The history of Jonah is so monstrous that it is absolutely incredible.” (as quoted in O’Hare, p. 202). Of the Pentateuch he says: “We have no wish either to see or hear Moses” (Ibid, p. 202). Martin Luther hated the Jews, which may be why he was against Esther, the first five books of the Bible, and other parts of the Hebrew scriptures. Because of his writings, I believe that Martin Luther actually believed more in prima Luther (the primacy of Luther) above sola Scriptura. And this was also reflected in certain of his doctrines and other practices as well. Those of us in the Living Church of God believe that all 66 books of the Bible are inspired and profitable for doctrine (II Timothy 3:16). 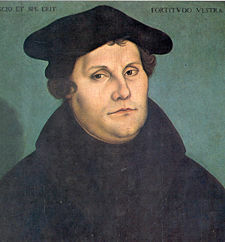 Because we also believe that we are not allowed to add or subtract from the Bible (see Revelation 22:18-19), we cannot follow the teachings of Protestant reformers such as Martin Luther—who changed or diminished the importance of at least 18 books of the Bible(Genesis, Exodus, Leviticus, Numbers, Deuteronomy, Esther, Job, Ecclesiastes, Jonah, Matthew, Luke, John, Acts, Romans, Hebrews, James, Jude, and Revelation)–further documentation is in the article Sola Scriptura or Prima Luther? What Did Martin Luther Really Believe About the Bible? Sola Scriptura or Prima Luther? What Did Martin Luther Really Believe About the Bible? Though he is known for his public sola Scriptura teaching, did Martin Luther’s writings about the Bible suggest he felt that prima Luther was his ultimate authority? Do you really want to know the truth? Statements from him changing and/or discounting 18 books of the Bible are included. This entry was posted on Friday, February 15th, 2008 at 5:29 am	and is filed under Church History, Doctrine.